Caught this cutie this am nibbling on the hemlock trees right near my house. Although I have a full body photo, I like this one for the fun of it. D500, Tamron 150-600@ 260mm, f/8,ISO 2000,1/250. Like what you have done here Cindy.. Almost a touch of xmas fun in the snow and yet also revealing a lot of it's life and the challenges of winter. This is a nice fun image of what really happens in our yards. We love having the deer around - most of the time. However their eating our bushes and spring flowers makes us wonder. Good capture of the perpetrator in action. Nice peek-a-boo shot! Great with all the fresh snow. Cindy, what a wonderful wintery mood you have achieved with this image! Well done! Cindy, love the peek-a-boo POV, intimate and captivating, along with a bit of 'aha, there you are!' A lovely wintry scene and mood you've captured - very much enjoyed. You were right when you said you had 'quite a bit of snow' last week! A great combination of the harsh realities of winter and the comical expression of this deer caught munching on your trees. Nice one, Cindy! Love the look she gave you through the snowy branches Cindy! Thanks all, for your comments. 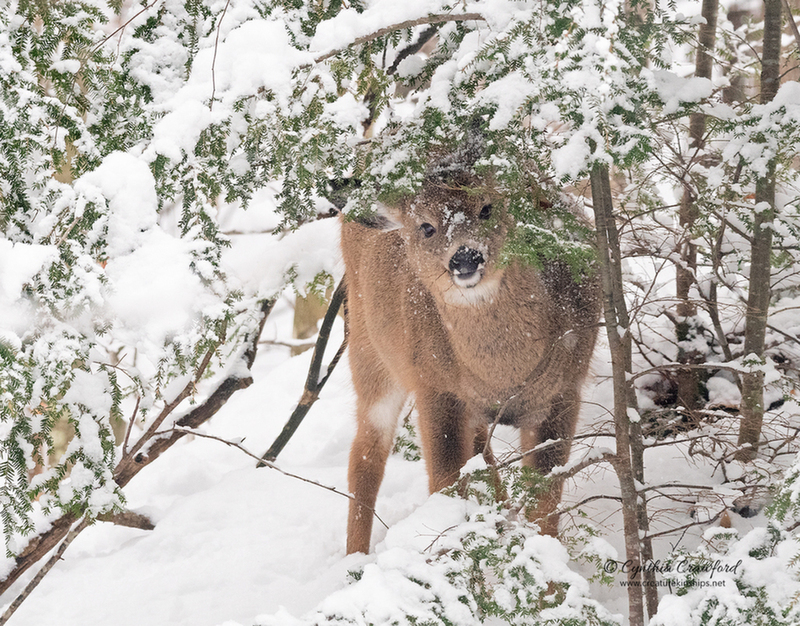 Yesterday AM I found this "cutie" and her friend devouring my holly and yew bushes, 2 feet from my front porch!. Not so cute. But I think it will be a tough winter with little forage- the deer have not done this for some 30 years. These are 2 fawns I am pretty sure I saw this spring with their mother.